Life with 2 small dogs and an eating disorder. A weekend crash course in crochet (requiring lots of help from Ravelry fora) and the pieces of the cardi finally got sewn together with the edging around the top. The knitting was by far the easiest part of this project. 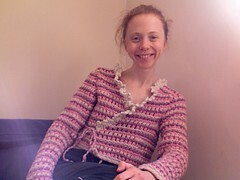 I nearly gave up after my third botched attempt at crochet, and again when I was struggling to set in the sleeves. I'm glad I persevered though.